My family and I love to go Letterboxing. We've beening "boxing" for about two years and we've found 39 boxes in five states. Letterboxing is a combination of treasure hunting, hiking and exploring. We even planted one letterbox. But here is where the sad sad story comes in. It was hard to decide where to plant the box. Even harder to pick a "theme" and hand carve a stamp. 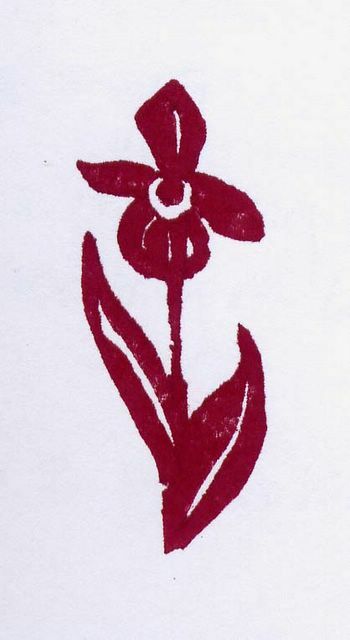 (Something I've never done before... but should certainly consider doing more often since they would be wonderful for fabric design...) Finally, we decided to make a box to recognize the very rare wild flower: The Lady's Slipper. When I was a child, I remember my mom talking about seeing Lady's Slippers with her dad when she was a child. But she hadn't seen any since. When we moved to Maine one of the neighbors said, "There's lots of Lady's Slippers in the woods right around here. They bloom in June." She was right. Hundreds and hundreds just behind our home and up the path into the woods to Claire's school. I thought it would be a wonderful opportunity to draw boxers to this area to see the flowers. We planted the box in August and I posted the clues inviting people to find the box anytime -- of course. But that if they came in June they'd have the pleasure of the real thing in addition to the stamp. Here's my hand carved Lady's Slipper stamp. Sadly, Lady's Slipper Letterbox has disappeared. Boo Hoo. I got an email from someone who tried to find in on Friday. As soon as I got her email I walked up the hill to confirm. It was true. Totally gone. The box didn't even make it to lady's slipper season. Why would someone take it? Not even really worth wondering. Stuff happens. I can probably recarve and rehide a new box before June. But I'm not happy about it. What is "letterboxing"? By context, I am guessing you leave a box for people to find while hiking and they leave you a letter? In the midwest we have this same sort of thing, but you do it in a corn maze. There is a map that leads you to clue posts and then you hunt for whatever is listed on the sheet. When you find all the objects and the owner of the maze gives you some sort of prize. Obviously this is only a summer and fall event here in Wisconsin. BTW, carving stamps is fun and addicting...more time to waste but you can say it is for your art. That is a lovely first attempt, Deborah. So sorry to hear about your loss. The stamp you made is beautiful. I followed the site you posted awhile back and was thrilled to see how many letterboxes there are here in San Diego. I tried to explain it to my 16-year-old son and showed him the website, but he doesn't get it. "Why do you do it?" he asks. How cool that you do letterboxing! I first heard about it on NPR a few years ago, and it intrigued me. But you're the first person I've ever known to do it! What a great family activity. Hmmm, maybe we'll give it a try this summer! Sorry your box vanished.